From the biological point of view, all chemical elements, inorganic substances and organic matter found in natural seawater works together. No part of this synergistic system should be omitted. That is why coral-shop team works hard to the most perfect attainable copy of natural seawater in every-day reefkeeping practice. 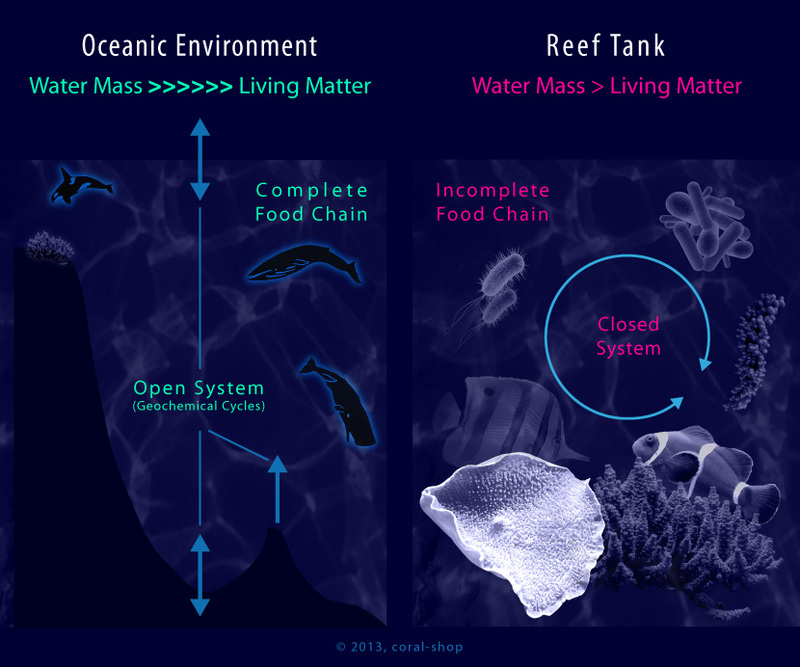 Continuous long-term extensive testing by independent marine aquarists helps to prove right direction of coral-shop evolution, based on the Natural Seawater Mimicking philosophy. 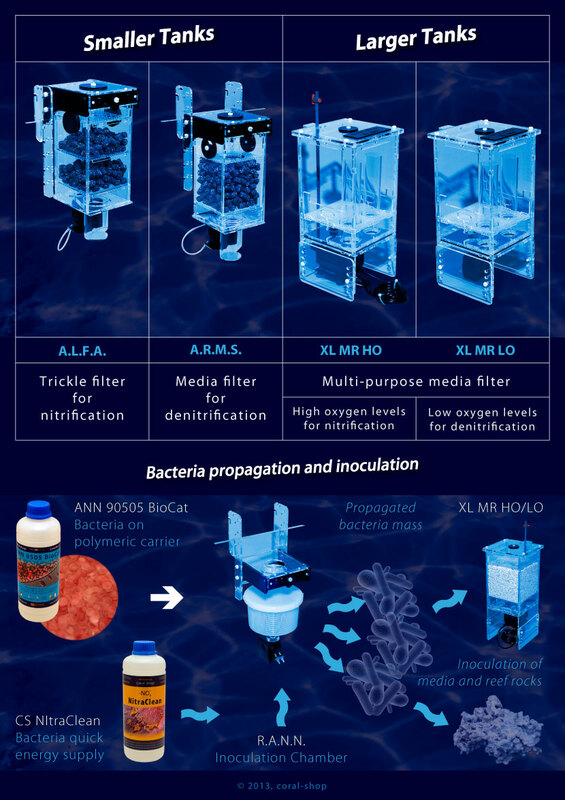 This leads to higher vulnerability of aquatic animals to various diseases and results in a need for regular replenishment of depleted matter, regular removal of unwanted matter and regular feeding, prophylaxis & optional medication. Point 1 is a key as possible lately detected deficiencies in the planning and construction phase of the tank and during technical equipment installation either cannot be corrected at all, or only with the investment of significant sums of money. Furthermore, some unfavorable tank and equipment parameters may have a strong negative effect on the subsequent long-lasting and regular care of seawater and animals. 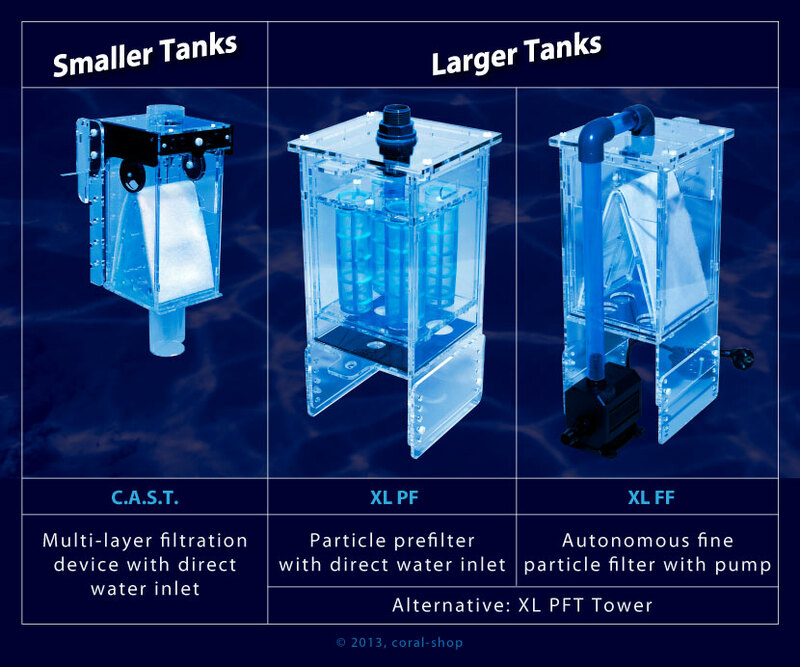 Daily regular care of seawater and the animals will never be effective enough without a professionally planned and constructed tank, equipped with a high-quality and appropriate technology. Every organism is capable to survive within certain limits of their living environment factors. If all conditions mentioned in Shelford"s law of tolerance in the living environment of an organism are met and one is not, then this one condition acts as the limiting factor. Partially decomposes and pollutes the tank with ammonia, nitrites, nitrates, phosphates and other dissolved unwanted matter. This situation requires powerful nitrification-denitrification technology and intensive phosphate removal. Mechanical prefiltration is not able to trap already dissolved unwanted matter and proteins passing freely through the filter. Chemical methods or skimming for the latter must be used instead. In some cases - especially in the tanks with large fish population - additional direct removal of ammonia by means of CS DeChlorAmm application can be very helpful. P1 Time Period - Immediately after the new absorber is applied the absorption rate hits the ceiling and is higher than needed. 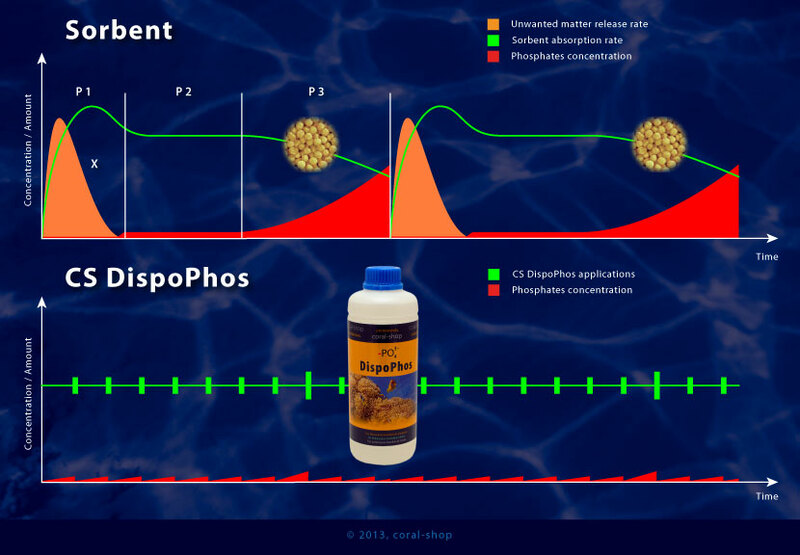 Zero phosphorus concentration is undesirable - trace phosphorus concentration in seawater is required - more information can be found in related article about phosphorus. Many absorbers also release unwanted matter - often toxic (orange area) - causing sometimes pH value changes as well. P2 Time Period - In the course of certain time the absorption rate is optimal - phosphorus concentration is held on trace level. P3 Time Period - From certain moment absorption rate falls gradually. The logical economical dilemma arises - when to proceed with absorber exchange? Particularly at this time period the absorber can also be colonized by various bacteria and if kept too long time in a tank, unwanted biological processes can be initiated. 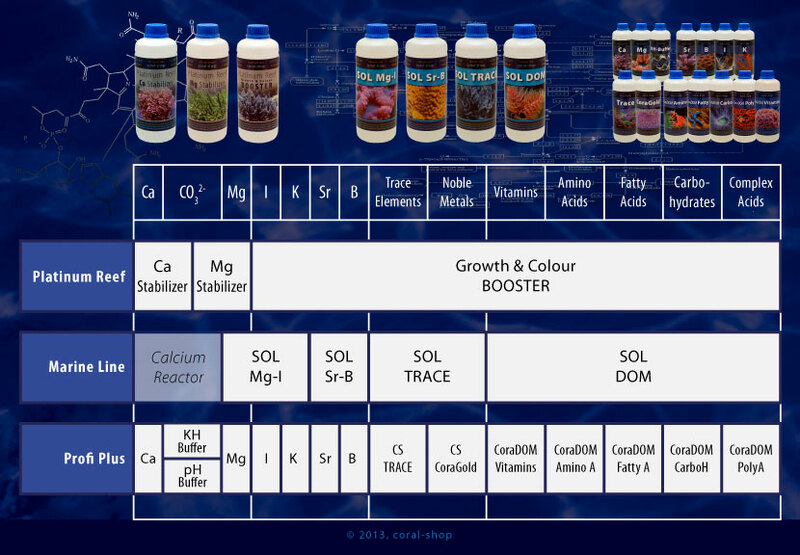 As regards to the depletion of elements and organic nutrients, CS Concept offers three alternative solutions: Platinum Reef, Marine Line and Profi Plus. All three conceptions are cross-compatible. Marine Line: 4-products solution mainly for calcium reactor users. 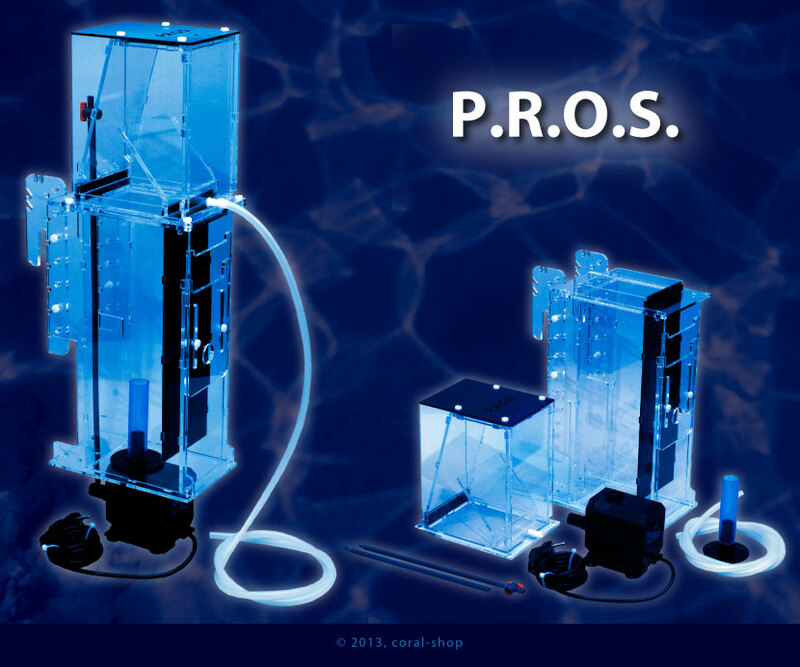 Profi Plus products are compatible and can be used for fine tuning of seawater chemistry. Calcium reactor can be replaced with Ca Profi Plus and KH-Buffer Profi Plus. Profi Plus: Each element and group of organic compounds has its own product. No need of calcium reactor. 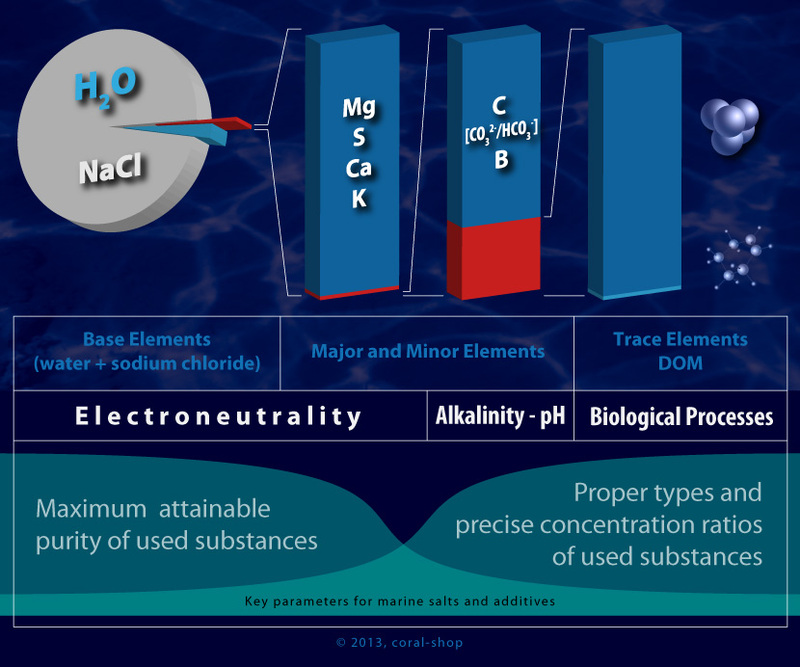 This conception offers highest level of seawater chemistry control. 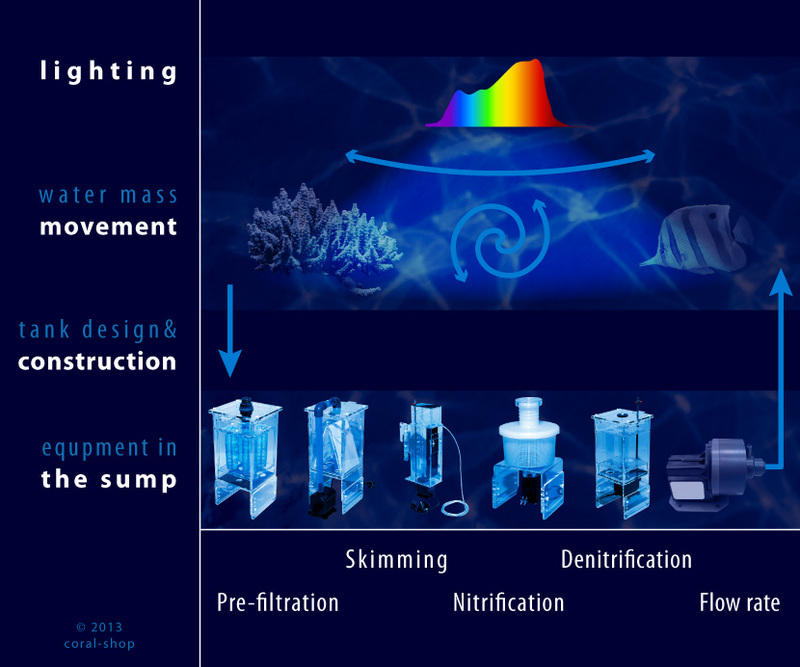 Even it can be used alone, it is primarily intended as a support for Platinum Reef and Marine Line conceptions for fine tuning of seawater chemistry. CS Marine Salt is a professional, 2-component marine salt of highest commercially attainable purity, intended for reef tanks. Product guarantees the following benefits for made seawater: Naturally identical composition - Perfect homogeneity - Highest commercially attainable purity. 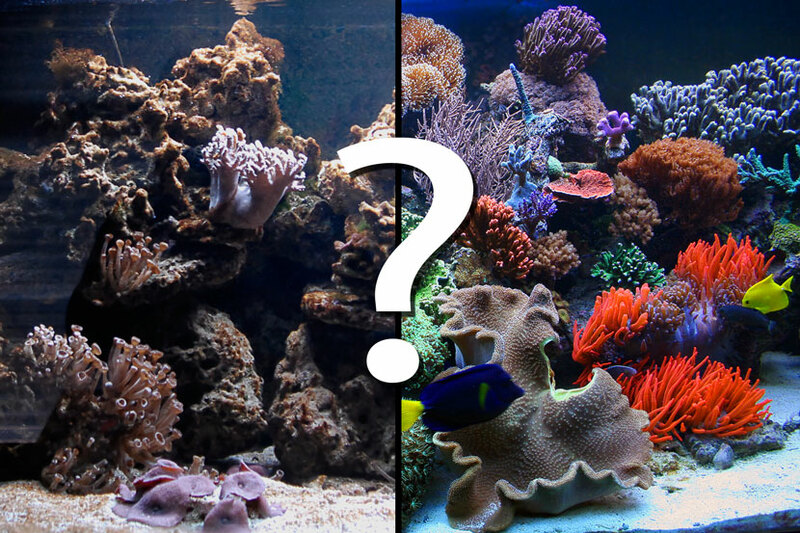 Each reef tank is unique, with different depletion rate of nutrients, while marine salt composition is always fixed. Seawater exchange as a sole tool for seawater chemistry maintenance will never work in a long run and cannot replace the role of additives. 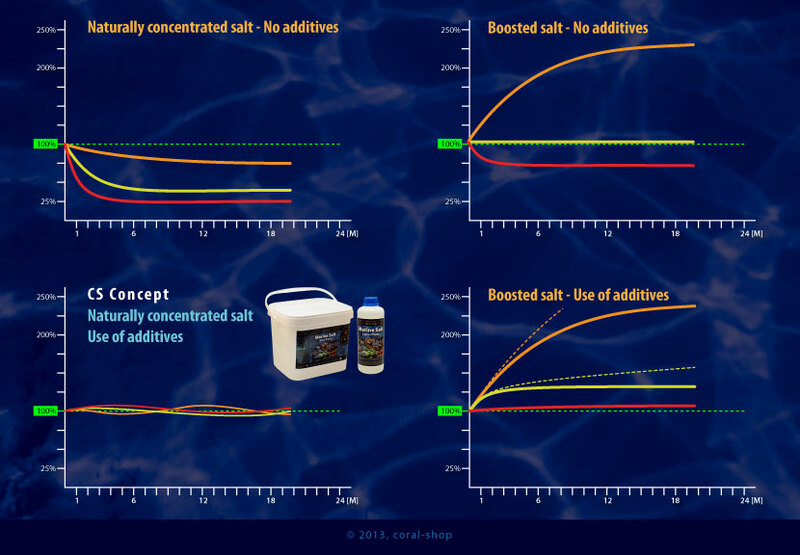 Majority of commercial marine salts is enriched with trace and minor elements - boosted salts. This is presented as an advantage - which is not. 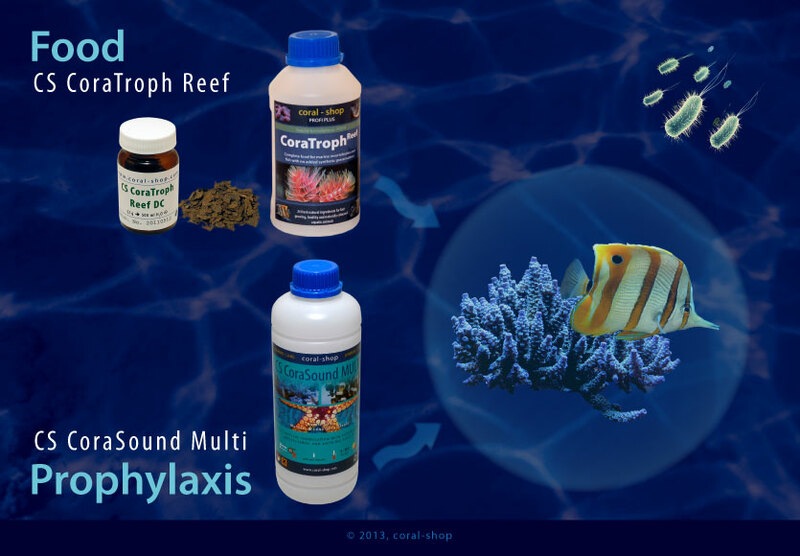 Feeding: There is a plenty of live, frozen and dried food preparations on the market and each reefkeeper will certainly find its own combination of products. 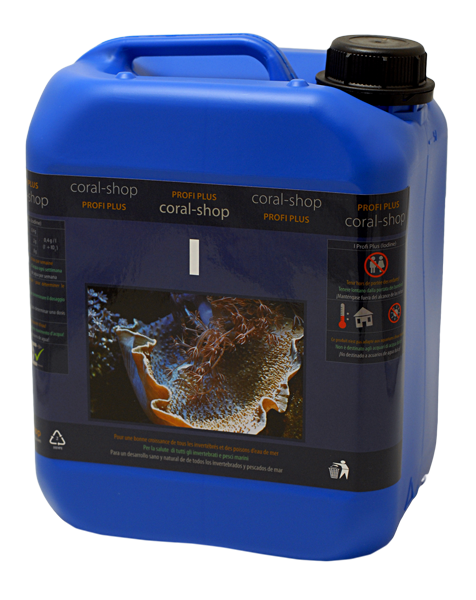 Nevertheless, we recommend including the CS CoraTroph Reef (more information in linked article) in feeding plan. Its unique composition ensures boosting of immunity and improvement of metabolism of all animals. More information can be found in linked article. 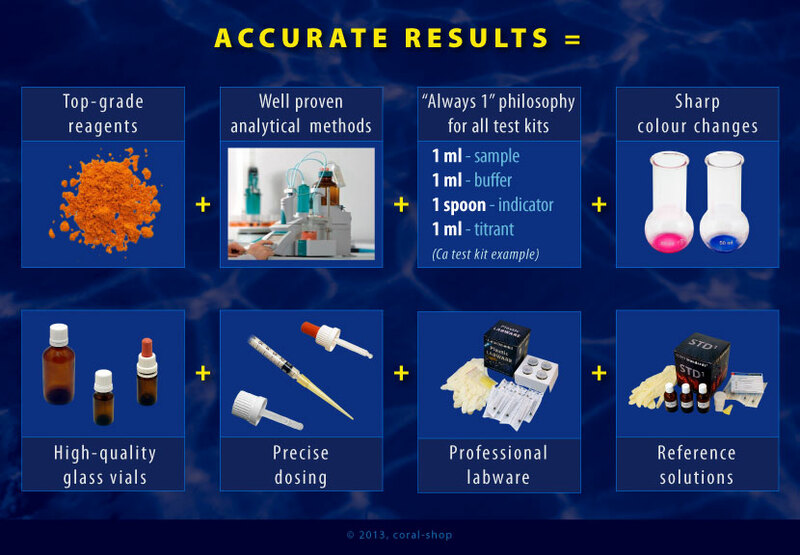 New colorimetric test kits for pH, ammonia, nitrites, nitrates and phosphates are currently under development. 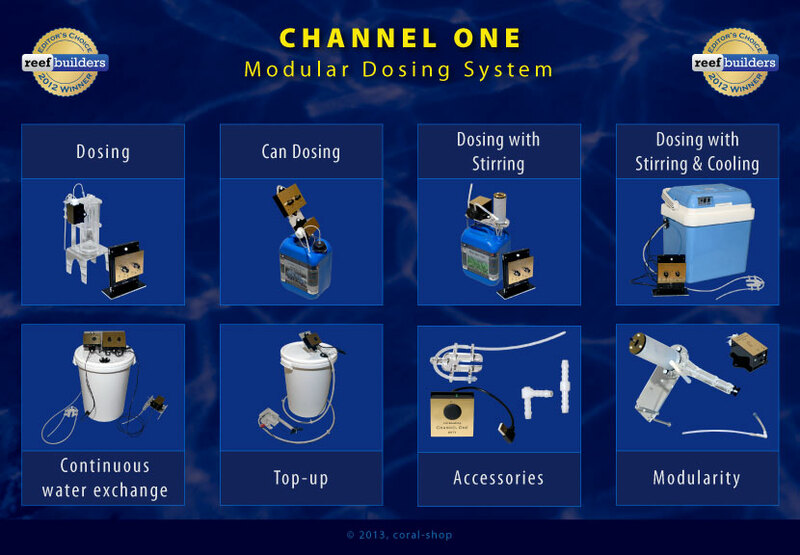 The modularity enables to create the tens of various configurations from several basic modules exactly according tothe users needs and to dose not only aqueous solutions but also inorganic and food aqueous suspensions including temperature sensitive ones. Another configurations serves for top-up and continuous water exchange.